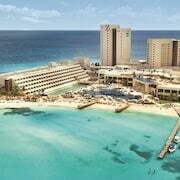 Located in Cancun (Avenida Kukulkan), Salvia Cancun is minutes from Forum By The Sea Mall and Forum Beach. 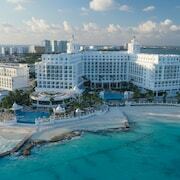 This beach aparthotel is within close proximity of Cancun Convention Center and Chac Mool Beach. Make yourself at home in one of the 80 air-conditioned guestrooms. Rooms have private balconies. Wireless Internet access (surcharge) keeps you connected, and digital programming is available for your entertainment. Bathrooms have showers and hair dryers. Take advantage of recreation opportunities such as an outdoor pool or take in the view from a terrace and a garden. This aparthotel also features wireless Internet access (surcharge), concierge services, and a television in a common area. Satisfy your appetite at the aparthotel's restaurant, which serves breakfast and lunch, or stay in and take advantage of 24-hour room service. Relax with your favorite drink at a bar/lounge or a poolside bar. Featured amenities include a 24-hour front desk, luggage storage, and an elevator (lift). A roundtrip airport shuttle is provided for a surcharge (available on request), and free self parking is available onsite.